A good poem is one that the world can’t forget or is delighted to rediscover. 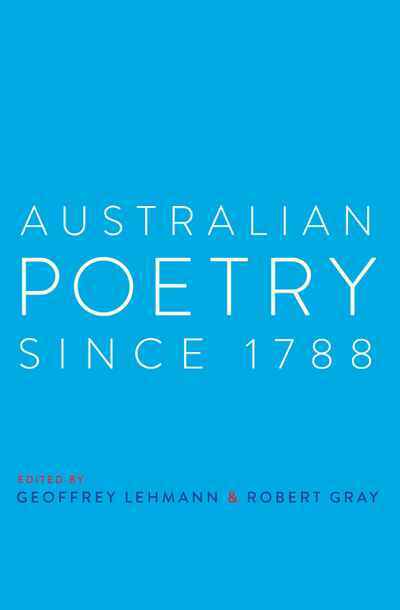 This landmark anthology of Australian poetry, edited by two of Australia’s foremost poets, Geoffrey Lehmann and Robert Gray, contains such poems. It is the first of its kind for Australia and promises to become a classic. Included here are Australia’s major poets, and lesser-known but equally affecting ones, and all manifestations of Australian poetry since 1788, from concrete poems to prose poems, from the cerebral to the naïve, from the humorous to the confessional, and from formal to free verse. Translations of some striking Aboriginal song poems are one of the high points. Containing over 1000 poems from 170 Australian poets, as well as short critical biographies, this careful reevaluation of Australian poetry makes this a superb book that can be read and enjoyed over a lifetime.